Where most pressure washing companies in Madison are auxiliary businesses to paint companies, Accurate Power Washing is a focused pressure washing business that includes painting and window cleaning as auxiliary appendages to the primary business of Accurate Power Washing. Accurate Power Washing, being a pressure washing company in Madison has been reaching out and building a solid clientele with solid references. 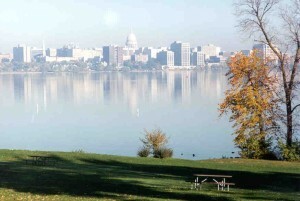 And building up confidence in the Wisconsin area being placed in esteemed recommended listings such as Angie’s List, neighborhood listing such as Virginia Terrace and other upscale west side listings, and most recently added to Golf and Leisure of Madison magazine as the only recommended pressure washing companies in Madison. This magazine primarily targets upscale country clubs such as Maple Bluff, Black Hawk, Bishops Bay, Shore wood Hills and country clubs in the Windsor area. The credibility of pressure washing companies in Madison. First and foremost to establish credibility in any industry you must put the time in to get there. There is nothing better than the knowledge you obtain from the hands on knowledge of doing a task for many years. For the past twenty five years I have done large fleet pressure washing jobs for a number of large painting companies in the area. With as many as twenty five crews all working at the same time. This process has given me an invaluable perspective into the ins and outs of pressure washing large numbers of homes and businesses. And the ability to schedule our pressure washing jobs into the time frame that works for you should not be a problem . An appropriate time frame for your pressure washing service should be easily met. If problems do a rise such as weather, previous commitments that were forgotten about by the customer such as double booking with landscaping or gutter cleaning companies. Pressure Washing Companies in Madison and what you should expect for customer service. Rescheduling should be a red flag unless it was made way in advance of your scheduled appointment. Many times clients and customers have taken time off to fit this power washing job into their schedule. We understand that your time is precious and we will do everything we can to meet your expectations. You should never feel pressured in any way. From the time we show up at your door we will do our best to make you feel comfortable with your pressure washing experience. Communication in any industry is central to the smoothness of how the power washing will proceed. This is why during our estimate we do not just show up and do everything with haste, we will take the time to explain everything thoroughly. So that you will feel confident in the selection of our company to proceed with your work. Thank you for taking the time to read this article on Pressure Washing Companies in Madison.